In a 5-4 ruling, the High Court decided that closely held, for-profit corporations like Hobby Lobby and Conestoga can choose to opt out of the Obamacare provisions that require employers to provide no-cost contraceptive prescriptions to employees. Note that the ruling applies only to closely held corporations that are owned and controlled by members of a single family – not to publicly traded corporations. The decision was based upon the Religious Freedom Restoration Act of 1993 (RFRA), which provides that a government "shall not substantially burden a person's exercise of religion" unless that burden pales in comparison to the government's compelling need. In this case, the government's need (for employers to provide no-cost contraceptive coverage to employees) was not considered compelling enough to override the business owners' religious objections. The Court views corporations as "persons" under the RFRA and holds that closely held corporations can have religious beliefs. "Any suggestion that for-profit corporations are incapable of exercising religion because their purpose is simply to make money flies in the face of modern corporate law," Alito wrote. Justice Alito – writing for the majority that included Chief Justice Roberts and Justices Kennedy, Scalia, and Thomas – said he accepted for the sake of argument that the government does have a compelling interest in making sure women have access to contraception. But he asserts there are ways of accomplishing that without violating companies' religious rights. In a dissenting opinion, Justice Ginsburg (Justices Sotomayor, Kagan, and Breyer also dissented) disapproved of this further expansion of corporate rights as though they are human rights. "The court's expansive notion of corporate personhood invites for-profit entities to seek religion-based exemptions from regulations they deem offensive to their faiths." She further warned that corporations could now ostensibly object to "health coverage of vaccines, or paying the minimum wage, or according women equal pay for substantially similar work." And to that end, whether publicly traded corporations could fall into the same corporate personhood methodology as the for-profit, closely held Hobby Lobby did today remains unknown. Also unknown is whether this ruling could eventually be expanded beyond the contraception coverage, as Justice Ginsburg suggests. But for now, it's a narrow ruling. It applies only to a specific type of corporation. And it applies to those only with regard to the contraceptives mandate within Obamacare. The Supreme Court makes clear that the government itself may provide coverage to female employees whose employers refuse to do so based on religious grounds. It is therefore possible – and very likely – that the Obama administration will, via federal law, provide for the government to pay for the contraception coverage. That means there will likely be no gap in coverage, despite the ruling. "The Supreme Court's decision won't change anything for people seeking insurance coverage through the new health marketplaces," Families USA Executive Director Ron Pollack said to NBC News today. "It also won't affect the vast majority of people who have employer-sponsored health insurance since most workers are in companies that are unaffected by today's ruling." The White House addressed the ruling soon after it was issued. "We will, of course, respect the Supreme Court ruling," White House Press Secretary Josh Earnest said after the decision was issued, adding that the administration will "consider the range of options available to the president." In terms of Obamacare, this Supreme Court decision is one that pushes legislators to further shape and define the law – something that both Democrats and Republicans can agree needs to happen. 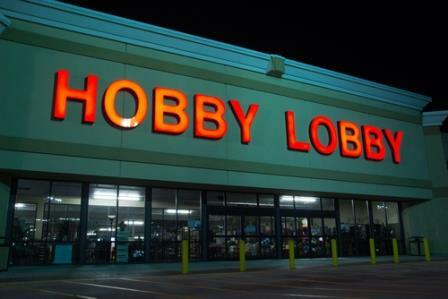 A little before 11 a.m. EDT, after delivering its opinion in Hobby Lobby, the Supreme Court adjourned until the first Monday in October. The ruling also applies to sole proprietorships and non-profits alike. If one more liberal judge is appointed to the Supreme Court, then your Freedoms are going to be reduced in future court decisions. Like it or not, its only one appointment away. Only if the Senate turns Republican can this legal trend be somewhat inhibited for awhile.